Figure 18 Water from rainfall slowly filters through sand or soil until it is trapped in underground aquifers. Pollutants picked up by the water as it filters through the soil can contaminate water wells. 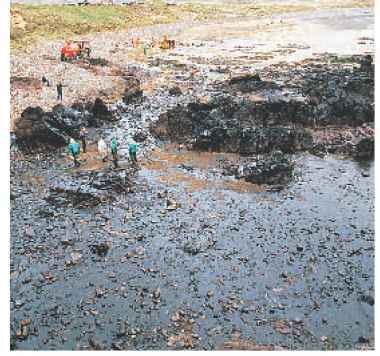 Figure 17 In 1996, the oil tanker Sea Empress spilled more than 72 million kg of oil into the sea along the coast of Wales. More than $40 million was spent on the cleanup effort, but thousands of ocean organisms were destroyed, including birds, fish, and shellfish. Ocean Water Rivers and streams eventually flow into oceans, bringing their pollutants along. Also, polluted water can enter the ocean in coastal areas where factories, sewage-treatment plants, or shipping activities are located. Oil spills are a well-known ocean pollution problem. About 4 billion kg of oil are spilled into ocean waters every year. Much of that oil comes from ships that use ocean water to wash out their fuel tanks. Oil also can come from oil tanker wrecks, as shown in Figure 17. Groundwater Pollution can affect water that seeps underground, as shown in Figure 18. Groundwater is water that collects between particles of soil and rock. It comes from precipitation and runoff that soaks into the soil. This water can flow slowly through permeable layers of rock called aquifers. If this water comes into contact with pollutants as it moves through the soil and into an aquifer, the aquifer could become polluted. Polluted groundwater is difficult—and sometimes impossible—to clean. In some parts of the country, chemicals leaking from underground storage tanks have created ground-water pollution problems. 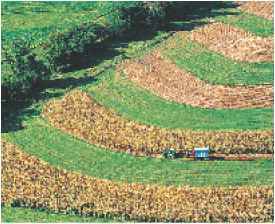 Figure 19 The farming methods shown here help prevent soil erosion. Infer why soil erosion is a concern for farmers. 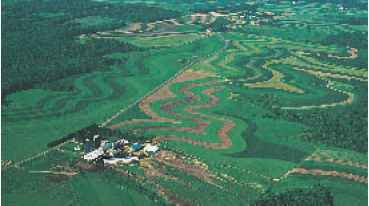 Contour plowing reduces the downhill flow of water. Fertile topsoil is important to plant growth. New topsoil takes hundreds or thousands of years to form. The Launch Lab at the beginning of this chapter shows that rain washes away loose topsoil. Wind also blows it away. The movement of soil from one place to another is called erosion (ih ROH zhun). Eroded soil that washes into a river or stream can block sunlight and slow photosynthesis. It also can harm fish, clams, and other organisms. Erosion is a natural process, but human activities increase it. When a farmer plows a field or a forest is cut down, soil is left bare. Bare soil is more easily carried away by rain and wind. Figure 19 shows some methods farmers use to reduce soil erosion. Soil can become polluted when air pollutants drift to the ground or when water leaves pollutants behind as it flows through the soil. Soil also can be polluted when people toss litter on the ground or dispose of trash in landfills. Solid Wastes What happens to the trash you throw out every week? What do people do with old refrigerators, TVs, and toys? Most of this solid waste is dumped in landfills. Most landfills are designed to seal out air and water. This helps prevent pollutants from seeping into surrounding soil, but it slows normal decay processes. Even food scraps and paper, which usually break down quickly, can last for decades in a landfill. In populated areas, landfills fill up quickly. Reducing the amount of trash people generate can reduce the need for new landfills. On steep hillsides, flat areas called terraces reduce downhill flow. 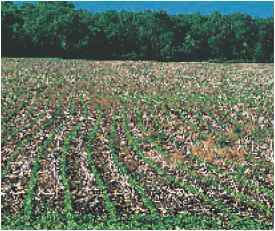 In strip cropping, cover crops are planted between rows to reduce wind erosion. In no-till farming, soil is never left bare. Figure 20 Leftover paints, batteries, pesticides, drain cleaners, and medicines are hazardous wastes that should not be discarded in the trash. They should never be poured down a drain, onto the ground, or into a storm sewer. Most communities have collection facilities where people can dispose of hazardous materials like these. Hazardous Wastes Waste materials that are harmful to human health or poisonous to living organisms are hazardous wastes. They include dangerous chemicals, such as pesticides, oil, and petroleum-based solvents used in industry. They also include radioactive wastes from nuclear power plants, from hospitals that use radioactive materials to treat disease, and from nuclear weapons production. Many household items also are considered hazardous, such as those shown in Figure 20. If these materials are dumped into landfills, they could seep into the soil, surface water, or groundwater over time. Hazardous wastes usually are handled separately from trash. They are treated in ways that prevent environmental pollution. • Vehicles, volcanoes, forest fires, and even windblown dust and sand can cause air pollution. • Acid rain washes nutrients from the soil, which can harm plants. • CO2 is a greenhouse gas that helps warm Earth. • The ozone layer protects life on Earth. 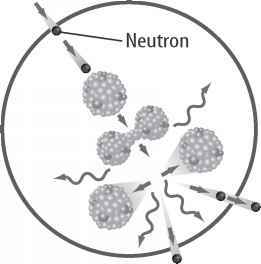 • Pollutants can build up inside of buildings. • There are many sources of water pollutants. • Wind and rain can erode bare soil. • Pollutants in soil decay more slowly than in air. 1. List four ways that air pollution affects the environment. 2. Explain how an algal bloom can affect other pond organisms. 3. Describe possible causes and effects of ozone depletion. 4. Think Critically How could hazardous wastes in landfills eventually affect groundwater? 10 times more acidic than one of pH 5, and it is 10 times more acidic than a solution of pH 6. How many times more acidic is the solution of pH 4 than the one of pH 6?